Now that I am in institute, I understand that question. In the next two days I have 3 assignments due that I am still working through with a lot of help. I was given a huge chart listing all our deadlines for the next 6 weeks. IT IS A LOT. It is a fast turn around time. Also, there is millions of little detail work that needs to be done that is not “due” but has to be done. Some examples include : putting boards in our summer classroom, printing materials, making sure we know procedures, contacting all the parents, etc. It is extremely time consuming. I have gone to bed everyday before 11. It feels very weird. I am used to staying up and doing work until 2/3 am. After being in sessions from 8am-6pm non-stop, I just cannot stay up. My body cannot handle it at all anymore. My brain cannot process anymore information after being in a informative sessions all day. I knew it was going to be go-go-go as soon as I arrived in Oklahoma City, Oklahoma for regional institute. TFA OK is very organized with the sessions and schedules. The expectation is high from the get go, no questions asked. The staff is very friendly and easy going. I am thankful for their dedication to the summer institute experience. I am doing my best to not get frustrated with the material and expectations. I was a philosophy major in college and did not anticipate ever to be teaching. 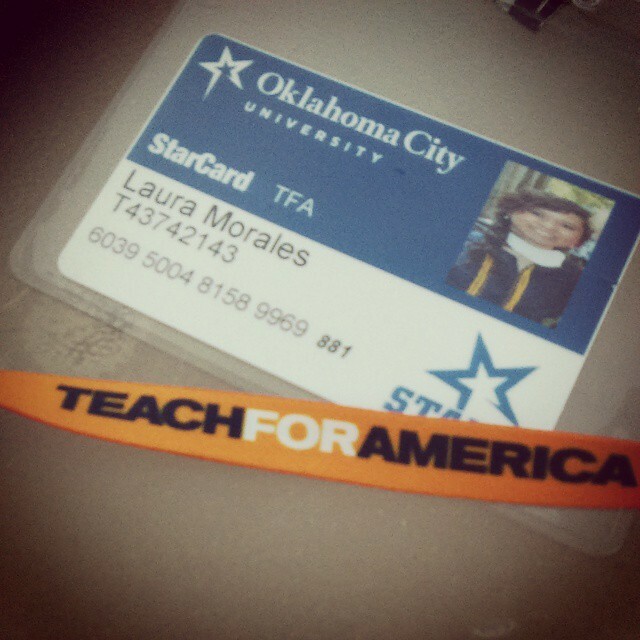 However, I accepted my TFA offer because I will get to work with the Latino community. Knowing that I get to grow with the Latino community in OK gets me going. I know it sounds silly but my life experiences and my personal visions only make sense in context of growing as a person and leader in the Latino community. Exciting news…. I contacted Dream Act Oklahoma and will be partnering with them as soon as I get to Tulsa, OK. I am beyond thrill about this because in SC I was not able to join any groups in the Latino community except my college’s Hispanic Association. However, what got me out of my frustration was finally getting to make phone calls to the parents of the students I will be teaching this summer. Hearing the voices and putting names with the vision of TFA, helped me tapped into my WHY. I am doing TFA because I was one of those kids. I am not going into my personal story in this post. But joining TFA is very personal to me. I have a co-partner who is also teaching in the same classroom with me. Since institute is 7 weeks, we will both take turns teaching the same students. I am partner A and will teach reading. My partner B will teach math. After two weeks, we switch content. We both will teach reading and math by the end of institute. I am a little nervous to start teaching in a classroom of 29 4th graders. I have never really hung out with kids so I have no idea what to expect. This is so new to me but I am very excited. I cannot wait to be in my class and see who I am as a teacher. I am pushing myself as much as I can.